Thomas A. (Tom) Bice is an ordained minister of the Gospel, an inspirational speaker, author of the books, The Faith of Champions, Raising a Conquering Generation, and The Laws of Wealth, a teacher, and entrepreneur. He was saved at the early age of 11 years old. He accepted the Lord's call into the ministry in 1982 while stationed in Stuttgart, Germany as a soldier in the U.S. Army. He has served as an associate pastor, and as a pastor in local churches. In 2005, the Lord led him to move to Fort Worth, Texas where he founded Tom Bice Ministries, an evangelistic outreach ministry to the lost Having encountered heartache, pain, and rejection, Tom understands the trials that often accompany everyday life. 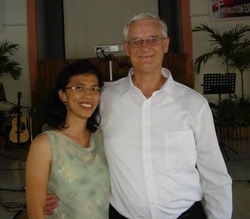 In November 2014 through the leading of the Lord, Tom moved to Los Banos, Laguna, Philippines where he currently serves on the mission field as the Pastor of Fresh Start Ministries International. He is also the Apostolic Founder of Global Impact for the Nations 12, a Christian evangelism and discipleship ministry to fulfill the Great Commission. It is founded upon the idea that every Christian can mentor and lead twelve people in the Christian faith, following the example of Jesus.The aim of the GIN12 Vision is to form disciples with a Christ-like character who in turn will 'go and make disciples' as commanded by Jesus. Through prayer, encounters with God, teaching, support and encouragement, disciples are then encouraged to also make disciples. Tom’s heart is to see lives changed, hearts healed, and dreams fulfilled. His dynamic preaching style captivates the attention of the audience as he delivers God's message of grace, faith, hope and the love of God. His message is simple: "By the grace of God, through your faith, you can change your life." 1. It is a vision to win the lost. 2. It is a vision to disciple the multitudes. 3. It is a vision to train and mobilize the Church. 4. It is a vision to multiply cell groups. 5. It is a vision to heal humanity and restore families. 6. It is a vision to release and empower men and women in leadership. 7. It is a vision to prepare the next generation. 8. It is a vision to transform cities and nations. 9. It is a vision to destroy the works of the devil. 10. It is a vision to redeem all areas of life. 11. It is a vision to restore God's purpose on the earth. 12. It is a vision to accelerate the completion of the unfinished task of evangelism and discipleship. Tom Bice Ministries exists to see the lost saved, healed, set free, equipped, empowered and serving in their communities by demonstrating the love and power of God. If you need prayer please contact Tom by submitting your request here. If you want Tom to speak at your church or ministry, please submit your request here.